Do you see something pushing up from the ground that looks like the claws of some creature in a zombie movie? Does it smell bad too? Happy spring! 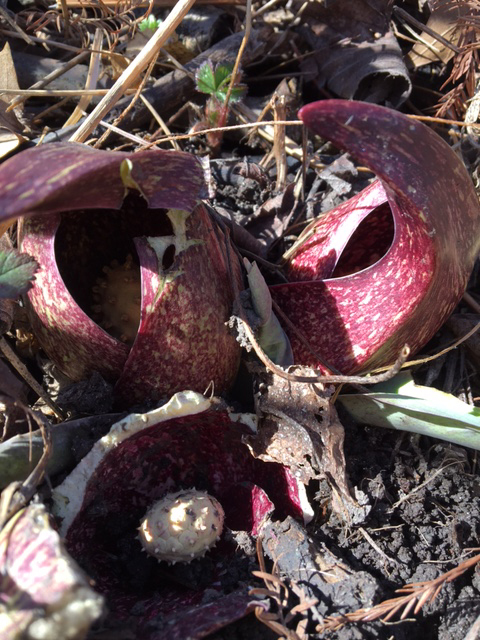 This charmer is the first native wildflower of a Chicago spring: the skunk cabbage (Symplocarpus foetidus). A skunk cabbage blooms in early March in the McDonald Woods. It’s a biologically intriguing, ecologically brilliant prelude to the wildflower riot about to burst forth on forest floors from the McDonald Woods at the Chicago Botanic Garden to area preserves. It’s a welcome sight to Boyce Tankersley, the Garden’s director of living plant documentation, who pointed out skunk cabbage as we walked through the McDonald Woods, the 100-acre restored and protected natural area that is home to at least seven state-listed threatened or endangered plant species. 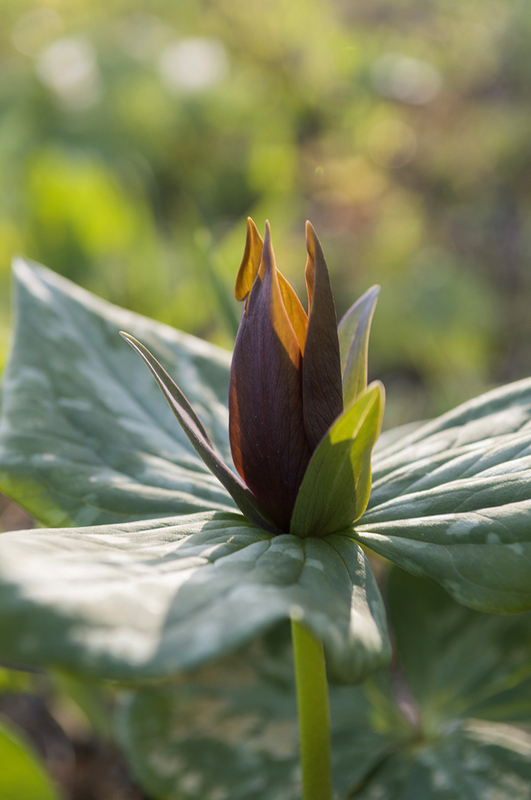 Skunk cabbage’s appearance means that the trilliums and bloodroot are not far behind. And spring beauties, star-flowered isopyrum, and cardamine, also called bittercress. Within a few weeks, depending on the weather, forest floors will be carpeted with wildflowers, courtesy of the sun streaming onto the earth before the trees leaf out and block it. Skunk cabbage isn’t conventionally pretty. What you see are the claw-like pointed red-striated hoods called spathes surrounding a nub studded with blossoms. The plant creates its own heat, even amid snow and ice. The temperature inside the hood can be 95 degrees hotter than outside. Thermogenesis is the goal for skunk cabbages, titan arums, and other “warm-blooded” plants. The heat creates the plant’s signature smell, a cross between a skunk (hence the name) and rotting meat. This turns skunk cabbage into a paradise for flies, which seek out rotting meat where they can lay their eggs. And flies do come to skunk cabbage. They flit inside the hood looking for rotting meat, then emerge covered with pollen. Then they fly inside another skunk cabbage, and pollinate it. Watch the Skunk cabbage video on YouTube. Skunk cabbage is picky about where it grows. You can only find it in fens, wet woodlands, and other places where water is moving beneath the soil’s surface. At the Garden, they’re alongside the path through the McDonald Woods. Outside the Garden, a good spot is the River Trail Nature Center, a Cook County forest preserve in Northbrook. And while you can see skunk cabbage now, the other wildflowers are still holding back. That’s because they’re smart. Which is why native wildflowers are almost never felled by a sudden freeze. The elegant—and less smelly— prairie trillium (Trillium recurvatum) is our next bloom to look for in the woods. Keep an eye out! In the next weeks, the wildflower show will be on in full force. In addition to the McDonald Woods, you can catch it at forest preserves, where invasive species like buckthorn and garlic mustard are regularly removed, as they are at the McDonald Woods. Some of my Forest Preserves of Cook County favorites not far from the Garden are Harms Woods near Glenview and LaBagh Woods near Cicero and Foster Avenues on the city’s Northwest Side. But the previews are open now. And it’s a real stinker.